Have you played any of the Monster Hunter (MH) games? Unfortunately, I am a complete newbie to the Monster Hunter series, with MH World being my first game. I played the limited time beta on PS4, and the game seemed as a different one for me than anything I have played but at the same time, I couldn’t decide if I like it. I am always open to trying new kind games at any time, and I have heard about this series but never really watched any gameplay or played it. I remembered the announcement trailer I watched during E3 2017 and just thought of re-watching it, which I suggest you watch once - I noticed one striking difference was there when compared to the numerous other trailers that were shown - it straight away had gameplay and that was the game’s first public announcement. In fact, every single trailer of the game has gameplay in it because I feel the developers are advertising their game as they meant it to be, without any cinematic lies or decorations - just the game in its plain form. 7 months later here is the game released for consoles (PS4/Xbox One). There stemmed my interest in the game and I took a leap of faith and bought it. Did not see or read a single review and here are my thoughts about “Monster Hunter World”. A short disclaimer: I have played the game around 15 hours now and these are just my impressions, not a review of any kind. Also, to the MH veterans out there - please excuse factual mistakes if any. The gameplay video and screenshots are from my playthrough in the standard PS4. Anything other than hunting monsters? 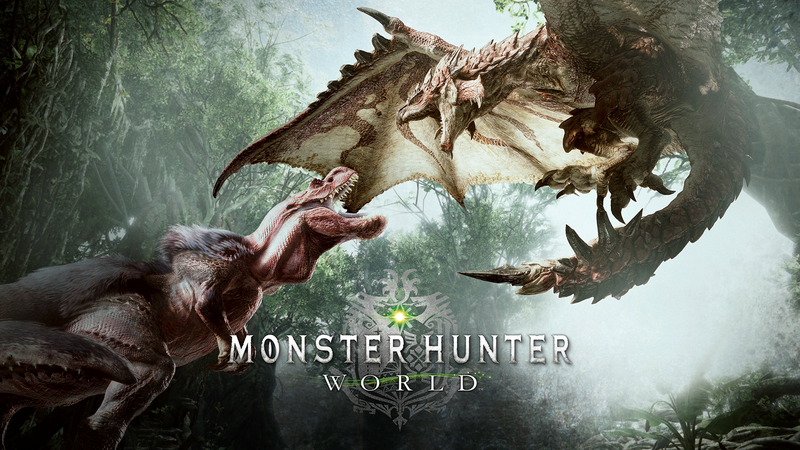 The game is as simple as the title says - we are hunters, we hunt monsters, simple right? Surprisingly that is the only simple thing about this game. Over the past years, I have quite grown an affinity to JRPG games, so I wasn’t baffled when I was instantly greeted with the complex equipment system, inventory management schemes, various separate mechanics about the game. At the same time, a difference I felt is all those was streamlined and presented to me which explained them clearly. This is one of the best aspects I love about the game, it never sacrifices its depth for accessibility by downgrading its mechanics, instead, it just does a better way of explaining those to the player. We get a quest from the hub world which can be story quest, optional events, side quests, small errands anything. We depart to the respective zone where the quest is needed to be done. Capture or Kill the monster as per the quest needs, return to base. Craft better gear or weapons using the monster parts, get more quests and start again. On the surface, this may seem like a boring, repetitive job but what makes it completely interesting is the amount of depth involved in each of the above steps. While getting the quest we need to choose based on our needs for crafting, or see which monsters need to be researched more so that we can take quests involving those monsters, or do we want to set more campsites in the open-zones so that it would be easier for us to travel etc. When you have chosen the quest, you are given a preparation phase where we can set up our supplies, choose our weapons and armor, customize our Palico (the small cat creature that follows us) eat any food which will give us bonuses, craft any items if needed. There are separate monster guides to refer to, that keeps updating as you face them more, gather more information about them. It will have details like the weak points of monster, which element is their plus/minus, what loot they will drop etc. Next is my favorite part, tracking the monster. The beauty of Monster Hunter’s world is the flora and fauna, it’s just biologically flourishing with many varieties of plants, insects, small to big creatures both hostile and non-hostile, completely varied terrain, caves, treetops and all sorts. The world itself is a character here which we need to learn about. We search for footprints or other signs of the monster, we can gather materials from a huge variety, analyze the terrain, know about the various labyrinthic paths. There is more depth to the world around us which I do not wish to go into detail here. The intense part is the battles. The combat is methodical, animation matters, each weapon type (14 types are there) has its own move sets, combos, pros, and cons. There are lots of videos and articles out there that explain about weapons, mechanics. The equal amount of depth is present in the Monster AI which is one the best I have seen till date. They are intelligent, respond to our attacks in surprising ways, they have their own routines like hiding and eating to restore health, moving to an area that would be advantageous to them and much more. Each quest has a time limit (real-time) so we have to plan very well to complete the quests within the given time. Finally, after everything is over, what does a hunter do? Prepare for the next hunt. There is no class system or separate upgradeable stats for our character. Instead, all the weapons and armor pieces (head, torso, waist, legs) have their own deep upgrade system, elementary affinity, gem socket system and much more which I am yet to discover. We need monster parts to upgrade or forge new gear, thus the gameplay loop as stated above. In case you are wondering why I haven’t mentioned a single word about story or characters you are going to be disappointed because that is not the game is about. There is a story campaign which has a decent story ( from what I played till now) only serves as the main element of progressing the game to new areas but apart from that, there are no complicated story arcs, character arcs or anything. Right from the trailers, the game is very clear on what it is and that is the gameplay, monsters various systems, mechanics. The incredible depth of the systems, mechanics and the way they work in harmony with each other to create great emergent gameplay. The process of exploration and hunting is completely up to us on how to tackle with no hold barred. Deep learning curve yet you clearly know what to do and how to proceed. This self-learning aspect is really great - as you play the game not only your hunter gets better-upgraded weapons and gear, but you as a player will improve. Some pathing issues of monsters during fights especially because of the uneven terrain. Most of the time won’t be a problem but can make you miss your hits on few occasions. Online co-op play needs to be explained more clearly. The coop teaming up is very good once you figure it out. This game grew on me very slowly as I discovered more and more of it. It’s intriguing right from the start and that is what kept me going back to it. While I initially felt that the game could have better story and characters, I soon understood those are not the identity of this game. It is about the stories we create (not like the catchy phrase sense, but in a true sense) and how we interact with this beautiful world. It is not a game that will induce you with wow factor on first sight, nor it is a game that shies away from its depth. Give it your time and it will open the doors to a beautiful world. I strongly recommend anyone who likes to try something completely different to buy this because unlike other games out there you exactly know what you are going to get with this. I am indeed going to continue playing this game for many more hours and I have full confidence that it will only surprise me at every turn. Monster Hunter World - A slow, sweet poison. A gameplay video and few screens. A good meal is always important before the hunt. The zones are expansive, even vertically.